Neon Glow Twister Tracks - awesome! The fun, flexible racetrack that glows beneath the LED lights of a sleek racer. The easy to build colorful track snaps together and bends, flexes, and curves to any shape or pattern you want. This brilliant set comes complete with one light up racer and 11 feet of awesome track. Watch your race track creation beautifully light up under the car's LED lights! 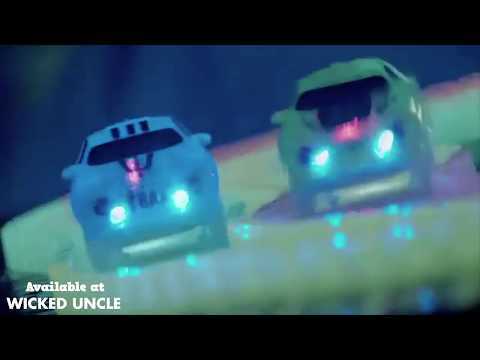 With an endless combination of colorful tracks, and the ability to add even more tracks and cars, this exciting race set makes for hours of light up entertainment. Turn off the lights, start the racer, and go! Use the joystick to move the maze pieces and test your skills! Upgrade your tag game with two vests and four dodgeballs.